Large-scale removal of an invasive beach grass pays off for a rare, coastal flowering plant called Tidestrom’s lupine. Deer mice can munch up to three-quarters of its unripe fruits under the cover of that grass. 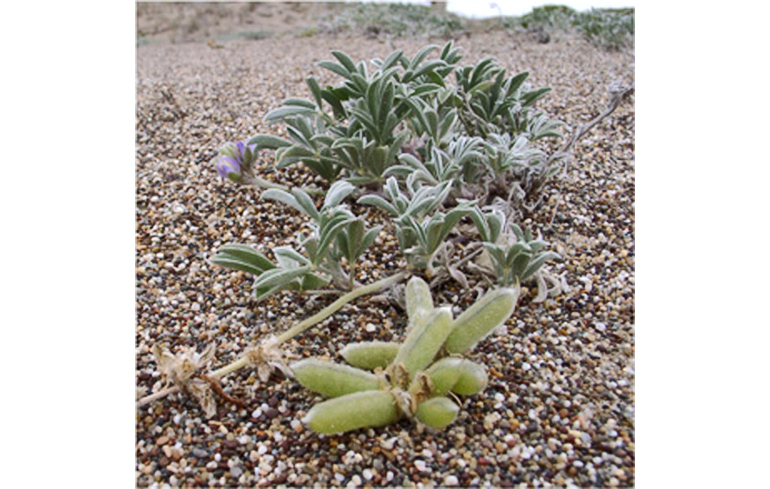 Pardini and her colleagues have just released observations from more than 13 years of working with the delicate, purple Lupinus tidestromii at the Point Reyes National Seashore north of San Francisco. She is the first author of the new study in Restoration Ecology. Native mice occur at elevated densities in beachgrass compared to native dune vegetation. Pardini and colleagues previously published work showing that beachgrass serves as a kind of Trojan Horse for the tiny mice, who feast on the seeds of the native lupine. They predicted that restoring the dune habitat—by removing the invasive beachgrass—could benefit Tidestrom’s lupine by reducing seed consumption pressure. European beachgrass, initially planted in the early- to mid-1900s to stabilize dunes, spreads rapidly and can re-sprout even from centimeter-long fragments. Coastal communities from Vancouver to Los Angeles have tried to fight the invader for decades by spraying it with herbicide, digging it out by hand, or burying it with heavy construction machinery. The opportunity to frame a dramatic before-and-after comparison came in 2010, when Point Reyes park managers went all-in on a restoration effort of the coastal dune community along the Great Beach. With excavators and bulldozers, they used a “flip and bury” technique: They unearthed 32 hectares of the invasive beachgrass from more than 77 hectares of sand dunes, buried it, and capped it with clean sand. Where once almost 80 percent of the lupine seed pods were consumed before they even ripened, researchers now estimate that mice are getting less than 3 percent of the pods. “What’s really new here is, we’re demonstrating that a large-scale restoration can produce a significant and sustained reduction in seed predation pressure,” Pardini says. The strong link between removal of invasive plants and improvement in reproductive success ultimately means new life for a species that Pardini and her colleagues once worried might become extinct within the park. At Point Reyes, the low, purple lupine flowers are coming back in abundance—the number of plants in the remnant dune area has hovered around 160,000 to 187,000 plants, but several hundred thousand new plants have been recruited to the restored areas. “A lot of the early successional native plants respond very well to large-scale restoration,” Pardini says. External funding for this research came from the National Science Foundation and the Alexander von Humboldt Foundation.